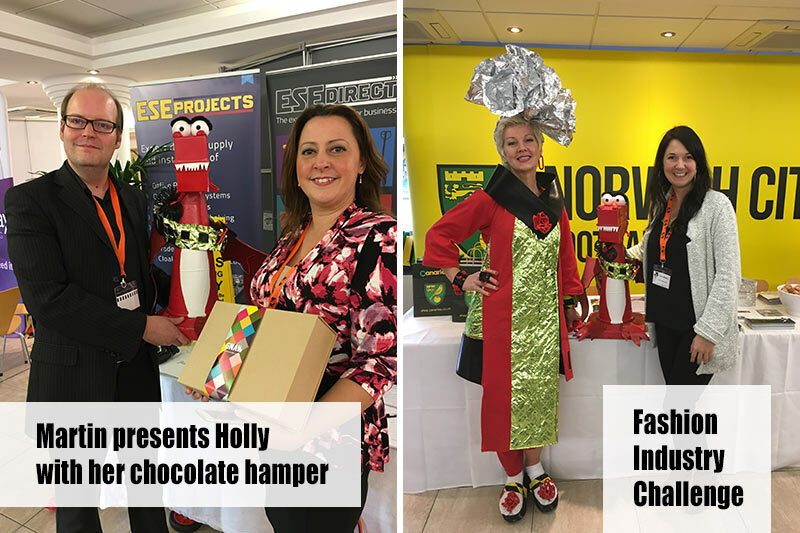 What a great day we had exhibiting, along with over 100 Norfolk-based business at the Chamber of Commerce B2B networking event. It was an early start for Martin and Debs as they headed off to Norwich City Football Club situated at Norwich’s Riverside. Braving the rain they met many of the other exhibitors on the way and Pumpcone and George provided an interesting talking point! All set up and ready to go, the event was then opened by BT Sports presenter and Norfolk boy, Jake Humphrey. As patron of Norfolk’s Break charity he also provided a fitted testimonial to their work. Event underway, we chatted to lots of lovely people, which provided opportunities to reconnect with past customers and contacts and to build new relationships. There were many fun elements built into the day too. 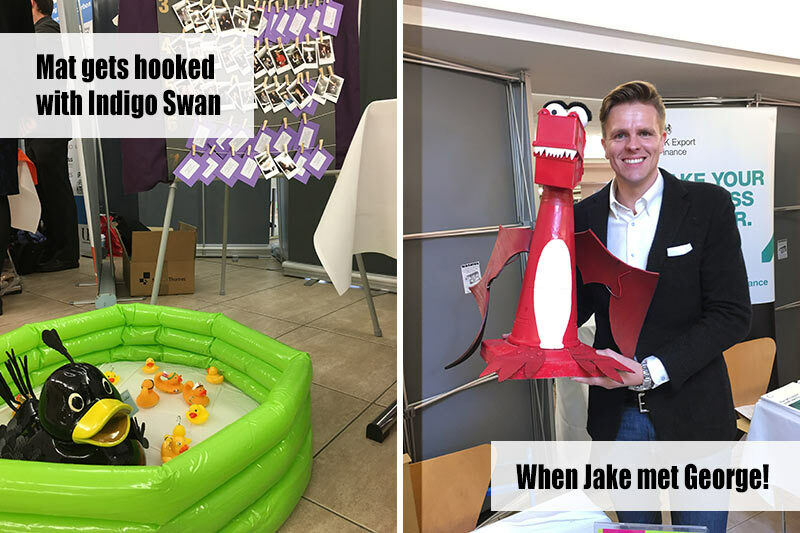 Our rubber duck Mat, enjoyed a dip in the ‘hook a duck’ pond at Indigo Swan’s stand, fortunately he avoided getting his head feather hooked! George and his PA got involved with the aliens (!) at Right Angle Events’ selfie station. 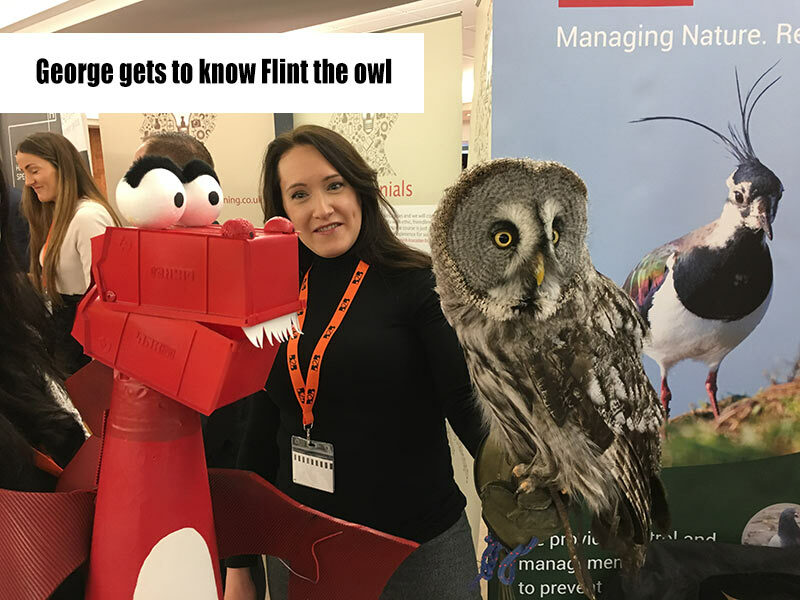 And George was over-the-moon to meet Flint the Owl and Scarlett the Hawk who were resident feathered friends with NBC Environment. Highlight of our day was of course the reveal of our Fashion Industry Challenge! Sally Adams really outdid herself and looked stunning in her Japanese, 80’s, punk inspired suit. Jake Humphrey posed for pictures with both Sally and George. What a star. Raising funds for Break charity our ‘Guess the weight of George’ competition to win a Gnaw chocolate hamper proved popular. Winning guess of 3.2kg came from Holly Stibbon of 101 Web Design and Development. Congratulations Holly! Looking forward to more business networking at B2B 2017!